Dolphin Terrace Elementary School was built in 1960 and has had only five principals since its opening. Mrs. Lorraine Martinez, the current principal, has been at the helm since May 2015. The school initially served grades first through eighth until 1967 when Parkland Middle School was built. A new cafeteria and library were added in 1997, a new parking lot and drop off zone in 2003, new administrative offices in 2005 and the Nautilus building, 15 classrooms for kindergarten - second grade, dedicated classrooms for Band, Orchestra, Art, two Science Labs and a Parent Center were completed in 2006. 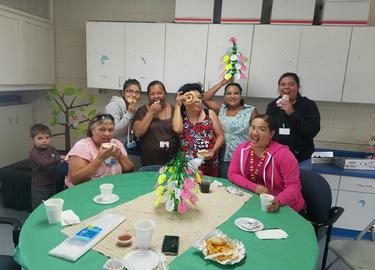 Our elementary campus volunteer program has been number one in the District since 2008 for the most volunteer hours. 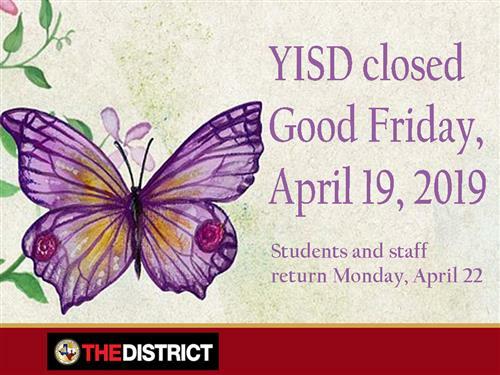 All parents are encouraged to participate in the volunteer program, walk on Fast Feet Friday's and support the school by helping teachers, students and the community. Each year students and the community donate food, blankets and clothing to help our families at the El Paso Mission and local food banks. In September of 2010 a new walking track for the community was added as well as new HVAC for the library in January of 2012. 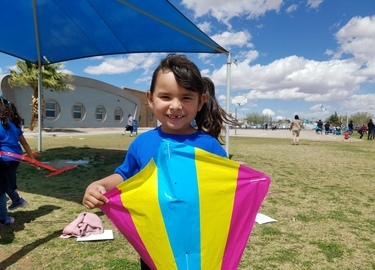 In August of 2012 the District made changes opening a new Pre-K in the area that serve the Employee Day Care for Ysleta’s northeast area and moved all 6th grade students from the four feeder elementary schools to Parkland Middle School. 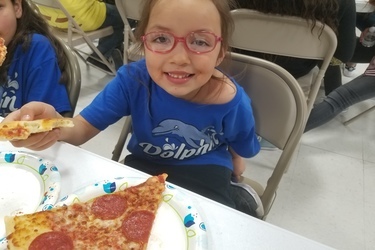 These changes make Dolphin Terrace a K-5 elementary school serving 600 to 700 students where we proudly continue to achieve an average daily attendance of 96%. 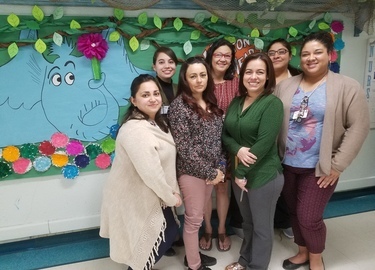 In 2013, our students and teachers received two of three Texas Education Agency "Distinctions" for Academic Achievement in Reading/ELA and Academic Achievement in Mathematics. Our goal is to receive all three "Distinctions" which will include Top 25 Percent Student Progress by 2014. Our instructional focus is to develop critical thinking skills and use them in mastering an integrated curriculum suitable for the 21st Century. All students are encouraged to read from the Renaissance Learning program earning points and trophies for their efforts. 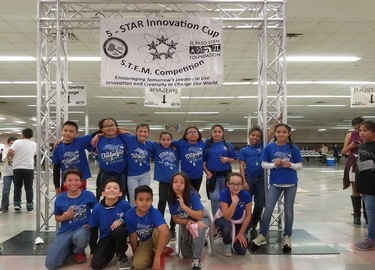 We utilize programs such as Wilson Fundations Reading, Reader’s and Writer’s Workshop along with the State’s required curriculum for math, science and social studies. 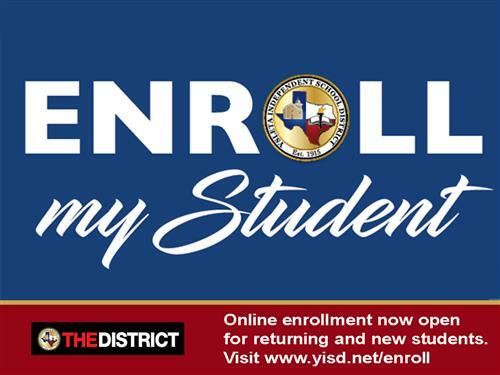 We have up to date technology for student and teacher use, consisting of iPods, iPad's, interactive white boards, document presenters, and each teacher has a District issued laptop for instruction. 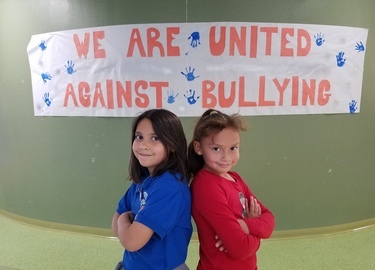 Dolphin Terrace was also the first school to pilot and implement Google Chromebooks, Google Drive, and Google for Education. Reader's and Writer's Workshop, Fundations, Wilson Language Reading, Esperanza, Literacy in Action, TEKS based Mathematics, Accelerated Reader, Education City, Reading Plus, Lexia, Study Island, Area Science, DAVE,Texas Fitness Now, Integrated Technology, Data Mart, Eduphoria, CHACK, Marathon Kids and 21st Century Grant. The school is proud of the volunteer program rated as one of Ysleta ISD Top 10 Volunteer Program Hour Winners six years in a row, Fast Feet Friday's, Campus Educational Improvement Committee "CEIC", Home-School Liaison, Student-Triad Conferences, Parent Nights, Ready to be Ready, Walk Your Child to School, Kids on Wheels, Fall and Spring Festivals, Day of the Dolphin, Spring Field Day, and Student Performances by Band/Orchestra. 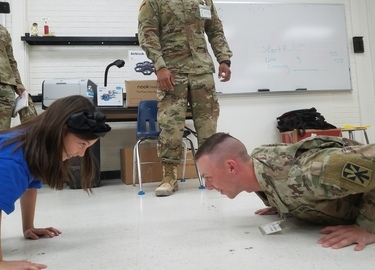 Ft. Bliss and Dolphin Terrace partner to promote healthy living and being phyically fit. 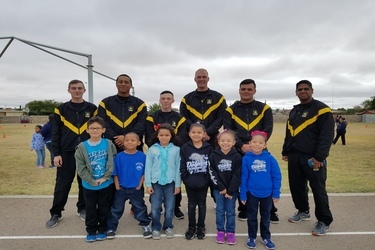 Ft. Bliss soldiers joined our Dolphin Terrace students in Fast Feet Friday. Students and invited guest compete to gather the most sticks to win 2 trophies, Student and Particpation. Students and guest must complete a lap in their designated course to recieve sticks. The class with the most sticks wins the Student Trophy. The class with the most student and guest sticks will win the Participation Trophy. Thank You to Ft.Bliss for partnering with us.